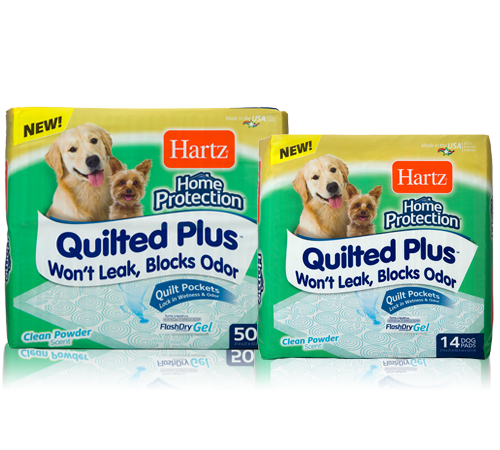 Hartz® Home Protection™ Quilted Plus™ are innovative dog pads that contain our FlashDry® technology, which creates a smaller urine spot and allows for multiple uses per pad. When nature calls, Hartz® Home Protection™ Quilted Plus™ instantly turns urine into gel to reduce tracking and makes clean up a breeze. A water-proof plastic backing and borders ensure our pads won’t leak. The special odor eliminating capability within all our Hartz® Home Protection™ Quilted Plus™ pads neutralizes odors left behind. Our unique quilt pockets trap and lock in wetness on contact to prevent spreading and leaking, unlike other quilted dog pads that channel the liquid away and off the pad. Liquid instantly turns to gel with our patented FlashDry® technology, locking in moisture to prevent leaks and odors. Our harmonizing odor technology neutralizes odors, doesn’t mask them, while releasing a fresh clean powder scent. Our Quilted Plus™ dog pad creates a small urine spot, allowing your dog to find fresh, clean spots for multiple uses per pad. Quilted Plus™ dog pads are also ideal for lining crates and carriers, drying wet paws or fur, elderly or sick dogs, or for use while traveling. Consumers are invited to take the Hartz® Quilted Plus™ No Leak Challenge by comparing their experience with Hartz® Home Protection™ Quilted Plus™ versus the brand they are currently using and sharing that experience on the Hartz® Facebook and Instagram pages. Each week, the first 20 respondents who post will receive a free package of the new Hartz® Home Protection™ Quilted Plus™ dog pads. The challenge is in no way sponsored, endorsed or administered by or associated with Facebook or with Instagram.